Coax your group’s inner biology nerd with unique educational activities such as a hands-on anatomical analysis of squids with the opportunity to use squid ink for a one-of-a-kind printmaking session. “The group that says ‘Ew’ together, stays together,” quips Lisa Carrie Goldberg, owner and lead nerd at Action Lab Potential, an ultra-cool science-art school at Christie and Davenport. What Goldberg started as a kids’ education hub has taken off as an adult-learning centre, rich with corporate and social event opportunities. Located in a charming century-old former pharmacy, the workshop is a long, narrow, light and white-filled space with decorative tin ceiling. Utilize the venue, complete with black board wall and house skeleton, for lectures, experiential activities or team-building fun. Out-front parking is ideal for adding in a food-truck catering angle. Fill take-away event bags with quirky educational items available from the on-site lab shop. 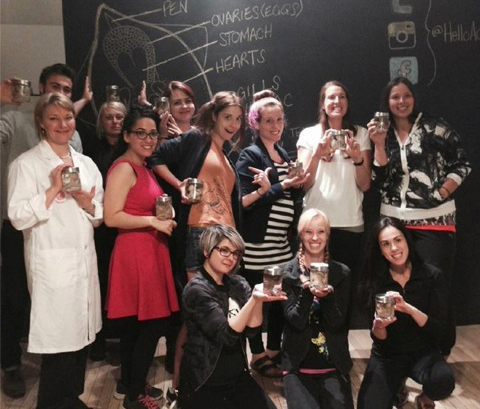 Check out the lab’s molecular gastronomy classes that let guests play scientist and chef. Our favourites include the Cosmos + Cocktails that pairs an astronomy prof with a mixologist. Action Lab Potential sessions are also portable — they’ll come to you.